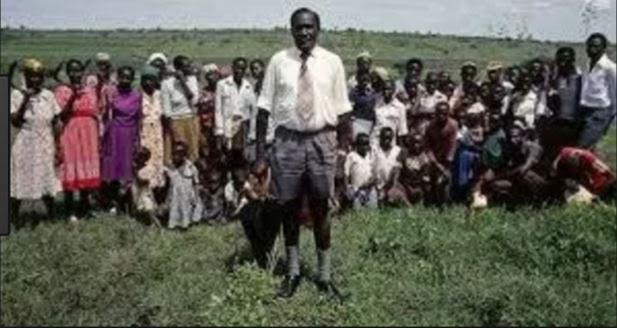 87-year old Sekuru Tauzen Mujaji from Chipinge South in Zimbabwe holds the record of having fathered 108 children with 25 women and 10 wives in a space of 43 years. Zim News reported that Mujaji, a Shangani tribe was born in 1930 but had traditional challenges which resulted in him being able to have his first born in 1974 when he was 44. According to him, it has always been his desire to have many children despite the challenges he is having in raising them. Mujaji, the only child in his family with a record 108 children says he does not use any enhancements to help him with his fertility, adding he still feels strong to have more children if only he finds people to help him support his family. His wives also confessed he has such charming powers and is still irresistible to this day. Mujaji currently has 10 wives and 35 children going to school, while others have since left for South Africa in search of greener pastures. A local member of parliament, Enock Porusingazi, who donated an assortment of food staffs to the family, with the help of the Manicaland Minister of State Mandi Chimene, says the family needs financial support as well as land for farming. One of his children has a disability, which doctors, however, say is a condition that can be corrected with physiotherapy.